“When a group of women come together to support one another through cancer, what happens often defies the expected.”WINGS," a support group in Verona, NJ, begun by a holistic nurse with a vision, offers connection to those suffering from the effects of diagnosis, treatment, and life after cancer. This book is not a guide. It is a beacon of hope. 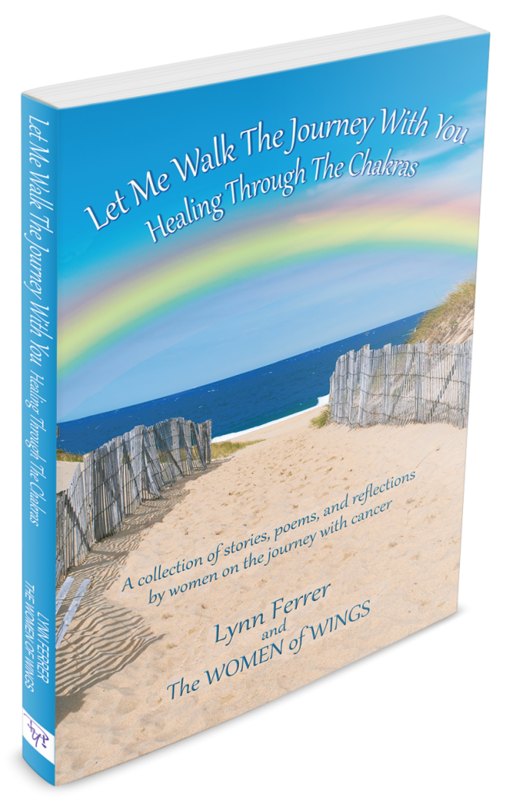 Emphasizing that no one need walk alone through a world of confusing medical information coupled with anxiety, Let Me Walk The Journey With You provides personal stories of women who have suffered the trials of a cancer diagnosis, as well as those undergoing a fight for their lives. Throughout the pages, you will hear strength and love. You will recognize fear. You will learn new definitions of courage and kindness. The uniqueness of each writer's story embraces the universal need in each of us. I promise you this...you will be moved." These beautiful words were written by our mentor and friend Julie Maloney, writer and poet, Director of Women Reading Aloud. I am Lynn Ferrer, a Holistic Nurse Practitioner, working in the outpatient cancer program at Saint Barnabas Medical Center, who is gratefully living her "Sacred Contract." I am passionate about my work and I love my patients dearly. I am honored to be a Founding Member of the WINGS Cancer Support Group for Women, and I feel truly blessed to be able to share my life with these courageous ladies.